Download "MITI Coding: Transcript 5"
1 1 MITI Coding: Transcript 5 T: Randy, thanks for coming in today. I wonder if it would be ok if I shared just a few facts with you that I ve gotten from the intake worker. And then we can go on to talk about what s on your mind. C: Yeah sure that would be alright. T: Alright. Your paperwork tells me that you are a 38-year-old gentleman; you ve been married 10 years. You manage a copy center. C: Yeah, I manage the copy center downtown. T: And your stated reason for coming in is because you got a DWI. C: Uh, yup that s correct. T: Ok. Can you tell me a little bit more about that? C: Uh, yeah, well a couple of weeks ago on Friday night, I was on my way home from a Foosball tournament and I got caught up in one of those traps. You know one of those DWI, you know uh. T: Checkpoints. C: Roadblock. And uh, yeah I felt like I was fine to drive but I guess the blood alcohol was a little bit over so they busted me. T: Yeah. And what brings you here Randy? C: Well this is my third DUI in I don t know about 10 years so um the judge said that I had to get some counseling or else go to jail. That was the choice that he gave me. T: Umhm. So what s your thought about that? C: Well you know I just think it was kind of a fluke. I mean I rarely go out and drink. I nearly always stay home and do my drinking there. So you know the fact that I got busted I think was just bad luck. T: So Randy you know at this treatment center we don t treat bad luck. That s not what we do here. And we don t work for the judge. We work for people who want to change their lives. That s what we re about. C: Yeah the judge said I had to get counseling. T: And I don t work for the judge. I work for you. 2 2 C: So wait, are you saying you re not going to give me counseling? T: Well I m saying I don t work for the judge. And if you and I come to an agreement about something you want to change about yourself then I am ready to work for you. But I m not ready to hang out here with you and do what the judge tells us to do. Because I m not into that. C: So basically, I have to sit here and admit that I m an alcoholic before you ll see me. T: If the shoe fits, fine. C: Yeah but you see I mean I don t drink that much. I have maybe a six-pack when I get home from work every night and that s about it. Maybe a little bit more on the weekends. I mean this DUI was just a random thing. I happened to get busted at a checkpoint. T: Umhm. So you re drinking six beers a night and that s everyday. Plus a little bit more on the weekends. So a minimum of 48 beers a week. 48 standard drinks. C: Yeah but I drink lass than any of my friends. All of my friends drink more than I do. T: So 50 beers a week sounds like a reasonable amount of alcohol for you to be drinking. C: Well I don t know. All I can tell you is I go over to my friend Fred s house and he s putting away a 12-pack a night you know and no problem. 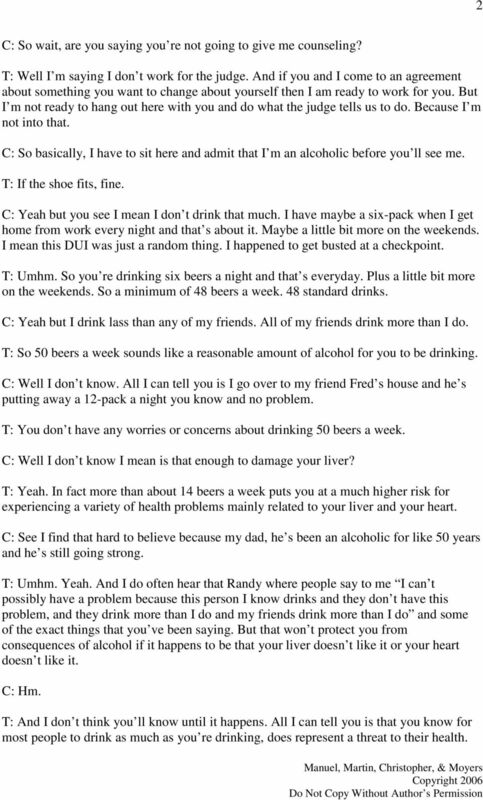 T: You don t have any worries or concerns about drinking 50 beers a week. C: Well I don t know I mean is that enough to damage your liver? T: Yeah. In fact more than about 14 beers a week puts you at a much higher risk for experiencing a variety of health problems mainly related to your liver and your heart. C: See I find that hard to believe because my dad, he s been an alcoholic for like 50 years and he s still going strong. T: Umhm. Yeah. And I do often hear that Randy where people say to me I can t possibly have a problem because this person I know drinks and they don t have this problem, and they drink more than I do and my friends drink more than I do and some of the exact things that you ve been saying. But that won t protect you from consequences of alcohol if it happens to be that your liver doesn t like it or your heart doesn t like it. C: Hm. T: And I don t think you ll know until it happens. All I can tell you is that you know for most people to drink as much as you re drinking, does represent a threat to their health. 3 3 C: Well you know I guess that might be one of my concerns then. Yeah, uh, I don t know. I just don t feel like I drink all that much. T: Randy, do you have any concerns about the impact of your drinking on your thinking and you re remembering and some of the functions of your brain? C: Oh no. No I manage that copy center you know I have to do reports and I have to balance the books, I have to do the taxes for the place, I have to do all the hiring and firing. I have to figure out shifts. No, my thinking is fine. T: Because I have some information about your blood alcohol level at the time of your arrest for this last DWI. And I wonder if I might share that with you Randy? C: Yeah you know they told me it but I don t remember what it was. T: Yeah. It was.23,.23 and uh. C: What s legal,.15? T:.08 C:.08. T:.08, yeah. And at.23 blood alcohol level, most people are vomiting, they re quite sedated, and they are at the threshold of experiencing blackouts. C: Yeah I can hold my liquor. I can drink most people under the table. T: Well, what that tells me is that you ve got a pretty high tolerance. And it also tells me that you re keeping your blood alcohol level high enough to probably be doing some damage to your brain. C: So.08, what is that like 1 beer? T: No.08 would be probably be 2 beers in one hour maybe 3 for you. 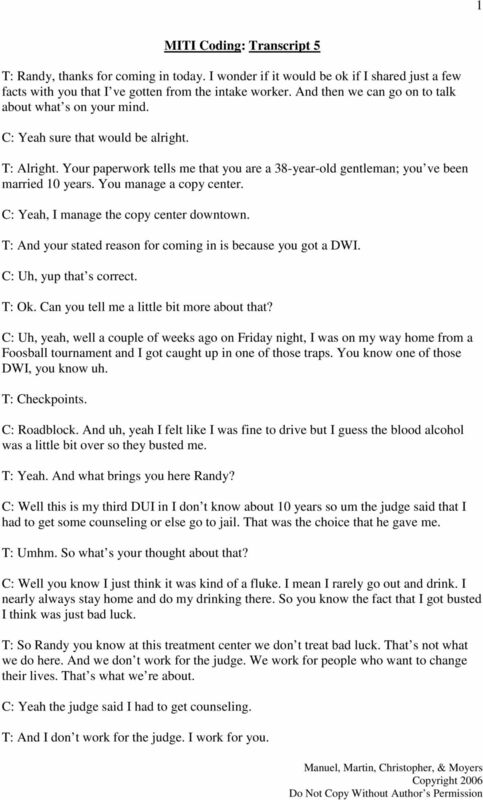 C: Yeah I might have had a little more than that T: Yeah so that s what you re, that s what your blood alcohol level is telling me about the kind of damage you re probably doing to your brain. C: Oh hey, I ve got a question for you, do you have the results of that stupid test that I filled out? The one where I, was you know, filling in the bubbles? What the hell was that? 4 4 T: Well that s the Minnesota Multiphasic Personality Inventory. Is that the one you re talking about? C: Yeah I guess. That test was a bunch of hooey really. T: Yeah and that test had built in ways of telling us whether or not you re being honest when you re answering the questions. And what your answers indicate is that you were not being honest when you took the test. You were not attempting to answer the questions straightforwardly. And it looks like the test didn t like you as much as you didn t like the test. So we re not really able to give you any feedback then because the test wasn t valid. C: Huh. How does the test tell if you re lying? T: Well that s sort of information I really don t want to share with you but it s pretty reliable. And I think we both know that you weren t making your best effort on that test. C: Well I ll admit to not making my best effort. T: So I don t know where that leaves us. There was some reliable information that we could have gotten from that that would have helped us with a treatment plan for you. But it sounds like a treatment plan isn t something that you re willing to consider at this point anyway. C: Well I have to consider it. The judge says it s this or jail. You know if I go to jail I ll lose my job, I ll lose my house. T: Well what kinds of things would you be willing to do in order to address the consequences of your drinking right now? What would you be willing to do? C: Well what about AA? I mean I ve heard about that. T: Yeah, I think AA is a pretty good idea for you Randy actually. I think going to a few AA meetings would be an eye opener for you. Because I think that at an AA meeting they re not going to put up with a lot of denial and minimization and the kind of thing I ve been hearing form you here. They re gonna you know really basically demand that you be honest about your problem. C: I can be honest. You know I ve told, I ve been honest about how much I drink. I just don t see that as that much of a problem. But T: I think you ve been honest about how much you re drinking, but I don t think you ve been honest about your concerns about your drinking. I don t think anybody can drink 50 beers a week and not have some worries about it. C: Maybe I m oblivious but I just don t worry about it. 5 5 T: Well I believe that. C: So can you give me a referral to an AA meeting or something? T: Yeah I have it. C: I don t know where they are or when they meet or anything. T: I have a sheet right here that has a variety of different AA meetings on it. And the one I m going to recommend for you, because you re working now, is the Dawn Patrol. And that meets every morning at 6AM. So you can be finished with your meeting and on your way to work by 7:30 or so. Even if you have to be at work by 8 you can still make it. C: Yeah, oh that works for me. T: And most of the people who got here are working and so they re going to be a little bit like you in that way. C: Right. T: So I think this is a good idea Randy. C: Well that s good because I don t want to go to a meeting with a bunch of whiny little college kids or something. T: Well yeah ok. I see your point there. But you know all different kinds of people have trouble with drinking. I mean all different kinds of people. Even people like yourself. C: Ok. I ll keep an open mind about it. Here s the referral sheet. I m going to give this to you now. C: OK. Thank you. T: And is there anything else you need from me? 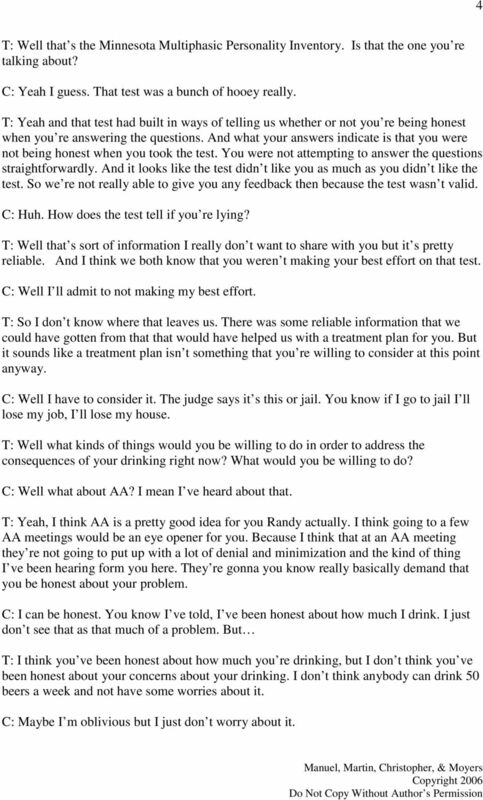 C: No I guess, do you talk to the judge or how does this work? T: Well what s going to happen is the judge is going to ask for my recommendation and I m going to recommend that you go to 90 AA meetings in 90 days. So that s a meeting. C: Every day. T: That s a meeting everyday for 3 months. C: Good lord. 6 6 T: That s my recommendation. So as you mentioned before, it s really up to the judge, what he would decide. That would be my recommendation. C: Alright. I ll do it. T: Alright. Randy it s been a pleasure to meet you. Here s my card. And if you need to get in touch with me about anything make sure you call and leave a message either on my voic or with my secretary up front. C: Yeah. Thanks. T: Alright. Bye-bye. Terri: Well Jim, I m glad you re here. I m kind of surprised to see you re coming back today. S: Can you tell me more about how HIV is passed on from one person to the other? James C. Sourris Artist Interview Series Gordon Shepherdson as interviewed by David Burnett David: So Gordon, you often talk about your painting as a kind of a record of your stay on the planet, you know. Turned down for DLA/AA/PIP? Think you re not getting enough? Okay, so Vin what is your personal philosophy on risk taking? Well I think risk is good, and you have to take risks I think to be successful. Consumer Study Understanding Long-Term Care Buyers Mutual of Omaha Insurance Company United of Omaha Life Insurance Company HEARTS &MINDS M28080 For producer use only. Not for use with the general public. CASE A: Caroline. You are an 18 year old woman coming in for a check-up prior to starting college. Your mother is in the waiting room.